All hands on deck: the Global Campaign to Return to Palestine needs our help to educate Americans about the Great March of Return. They propose a “tent campaign,” a rich metaphor for refugees and demolished homes. Here are instructions, plus an offer from If Americans Knew for free materials to hand out. Palestinian nonviolent demonstrations at the Gaza border have been ongoing for a month now, and will culminate soon: May 15th is the anniversary of the Nakba (as well as the anniversary of the founding of Israel), and a massive march is expected. Ahead of that moment of critical mass, Americans need to be equipped with an accurate understanding of the situation in Gaza. Without a clear picture, they are bound to fall for the conventional pro-Israel hasbara. The Global Campaign to Return to Palestine has called on us, advocates with a voice, to spread the word. We need to answer that call. GCRP PROPOSES a “tent campaign,” in which Palestine advocates erect tents in conspicuous places in our cities, and from there share information with passers-by. These tents are a perfect conversation-starter, since the Great Return March rallies around tents, and symbolize the plight of refugees and those whose homes have been demolished by Israel. GCRP has put together some excellent suggestions for implementing the tent campaign (below), and each of us can add our own creative flair. We hope you will take up the standard and advocate for the innocent people of Gaza – and all Palestinians, in the West Bank, East Jerusalem, Israel, and the diaspora. We hope hundreds of tents will pop up all over the United States, and thousands of Americans will learn the facts about the Right of Return, the occupation, and the decades of injustice. If Americans Knew wants to help you help Palestine. We have created “tent cards” and other materials that you can use, free of charge, to inform and educate those in your circle of influence. As we come closer to the 70th commemoration of the occupation of Palestine and displacing its people by the Zionist gangs, and in the light of the bargain of the century and what preceded it of conspiracies targeting the heroic Palestinian people, we find that it is our duty as civil society organizations to be in the lead of supporting any movement that advocates the rights of this steadfast people who has given more than thirty martyrs and thirty thousand wounded just in Gaza since Land Day Commemoration till now. They were targeted by Israeli snipers, where many have had their limbs amputated and a great number of them has now become permanently crippled. The Great Return March has become an illuminating point in the tragedy and suffering of the Palestinian people, which also confirms without any doubt that the Palestinian cause is still alive deep down the souls of the generations. This holds us responsible to be an echo for them, all around the world through setting up what we can of cultural and popular activities at this crucial time. Today many imperialist forces are trying to carry out the bargain of the century making Al Quds the capital of the Zionist entity as a first step. This proposal suggests to set up a tent in one of the public squares in your city in solidarity with the Great Return March in Gaza. And in addition to what the tent means of the symbol of the displacement and right to return, the square in which the tent is to be set up, has to be one of the symbolic places in your capital or city, and we suggest it lasts for a few days so that it helps spread more awareness and attracts more solidarity. 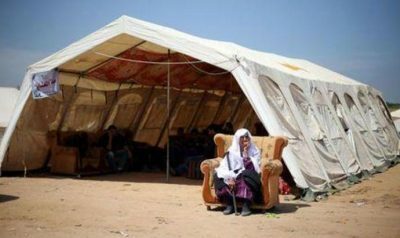 There will also be a live broadcast of the activities from Gaza in the tents around the world and the reflection of the tents activities among each other and to Gaza. Setting up various exhibitions about: the right of return, the ongoing Great March of Return along with pictures about the daily clashes, exhibition about Al-Quds and the effects of the bargain of the century (the campaign will prepare the exhibitions) as well as cultural and media activities in order to promote this movements. Organizing intellectual seminars to highlight the right of return cause after 70 years of the Nakba and displacement, and the bargain of the century and its strategic danger on the cause. Hosting symbolic political, academic and sports figures and recording interviews with them. There should be one or two reporters present in the tent in order to carry out interviews with the guests and to share them with the members of the campaign around the world. The forum of non-governmental organizations: It is a national internal forum which gathers all non-governmental organizations that support Palestine in some of the member countries in all different intellectual and ideological aspects of those organizations in which they include civil, legal, and cultural, sports and artistic associations. Forming an honorable pact on the civilian work to support Palestine and Al-Qods, exchanging expertise among the associations. Translated to English by Mustafa Hijazi.